1. Add 1/2 cup of water and little food colour to sugar. 3. When it reaches an one string consistency remove from flame and add rose essence. 4. Combine maida, corn flour, gram flour, curd, cooking soda and little food colour. 5. Add little water and mix well to an idli batter consistency. 6. Add some of the batter to a plastic bag and make a small hole at the other end. 8. Squeeze the plastic bag over hot oil to form a spiral shape (jalebi). 9. Fry till golden brown and crisp. 10. Remove and drop it into the sugar syrup. 11. After 45 seconds, remove and transfer to a plate. 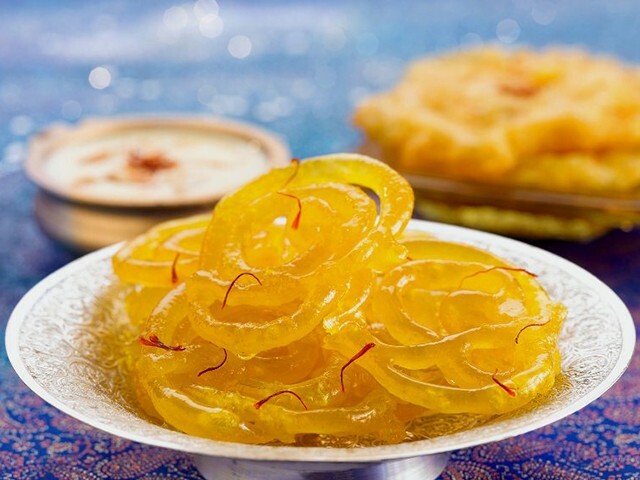 Feel free to comment or share your thoughts on this Rose Jalebi Recipe from Awesome Cuisine.